We’ve been very blessed that we have little difficulty getting the children to sleep at night. We usually begin our bedtime routine (potty, pajamas, brush teeth, books, songs, sleep) around 6:30-6:45PM and both kids are asleep by 7:30PM most nights (often sooner!). Seriously, if you need to block the light coming from a window these are the window covers that you need! We love these window covers so much that we have them in ALL of the bedrooms…including ours! My husband works shifts, so when he works midnight and sleeps the next day, the Blackout EZ Window Cover keeps the room really dark so that he can get the best quality sleep. 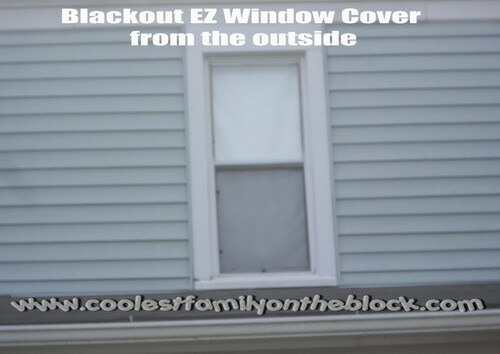 Not only does the Blackout EZ Window Cover block out all of the light, but it has many other great features that make it the best window cover on the market. *It’s super easy to install! No drill, screwdrivers, or other tools needed! 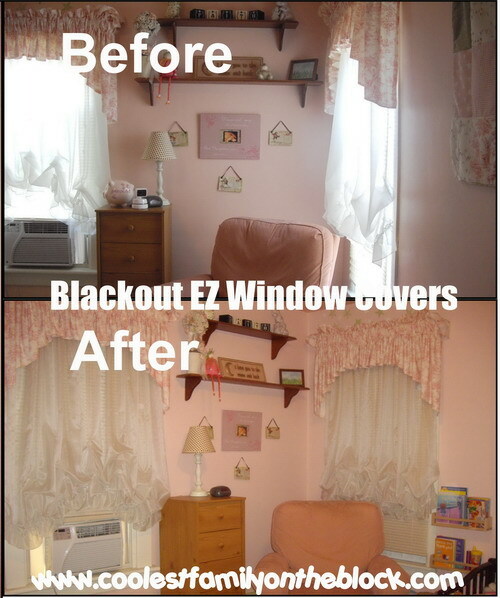 *It installs with your current window treatments already in place! You don’t need to remove your curtains or blinds to install! Don’t ask me how, the fabric is practically indestructible but cuts easily with scissors. In over a year I haven’t needed to clean them, but if I do you just wipe them down…unlike blinds and shades which are horrible to clean. The cover blocks out everything, unlike blinds, no one can see anything inside. Disclaimer: I found, purchased, and reviewed this product on my own. I did NOT receive anything for free, I was NOT compensated in anyway for this review, and I was NOT asked to do this review. All opinions expressed are my own. I just really think this is a great product! 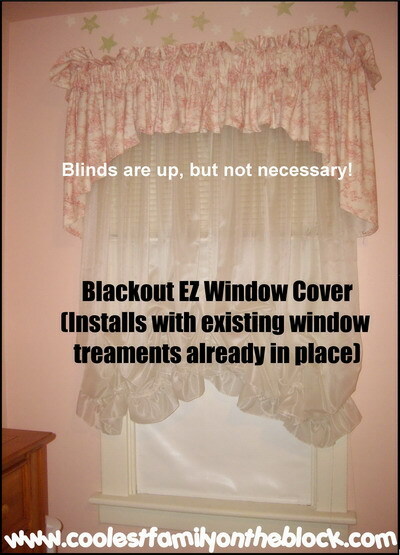 If you have the time, watch this great demonstration video from the inventor of Blackout EZ Window Covers himself. He shows you how to install the covers on 3 different windows. 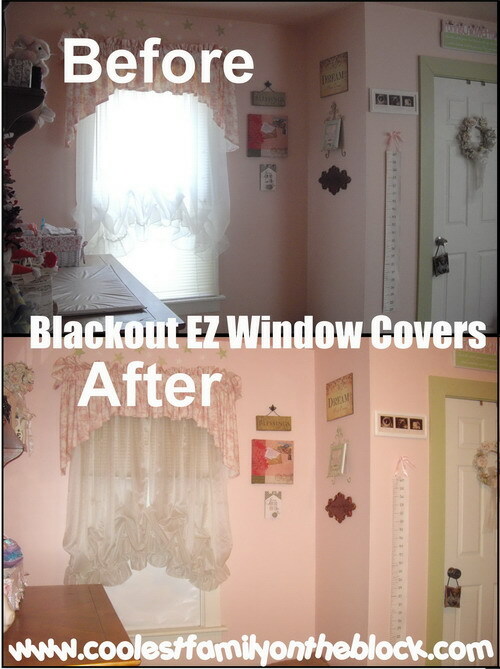 Blackout EZ Window Covers are available for purchase on their website: www.blackoutez.com. 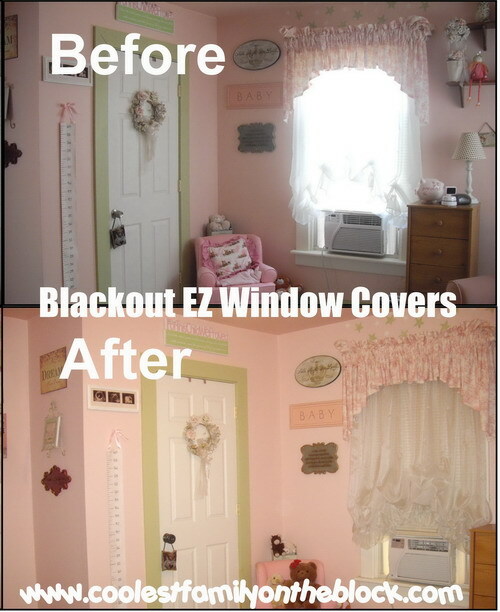 You can follow Blackout EZ Window Covers on Twitter (@BlackoutEZ), Pinterest, and like them on Facebook as well. If you found this review helpful please leave a comment here or on YouTube, “thumbs up” the video on YouTube, and feel free to like, pin, tweet, and otherwise share this review! Thanks! Do your kids have trouble sleeping while it’s still bright out? How do you keep your rooms dark for sleep? Let me know in the comments! Fun in a dark room! Posted on July 17, 2013, in Reviews, Videos and tagged reviews, sleep, videos, vlog. Bookmark the permalink. 22 Comments. So far I haven’t had a problem with my girls sleeping during the day. However, if I did this product would be pretty awesome! Thanks for taking the time to review it! Thanks, Becca! It is pretty awesome. My daughter always napped fine during the day, but once she understood the concept of night = dark it was difficult to get her to sleep at night during the summer. These were a lifesaver! Can I come with you in the bomb shelter, Terra?! It’s so noisy out here! The latest my kids sleep is 8:30am and they’re usually up by 7:30am. I’m NOT a morning person, so that’s still too early for me but WAY better than a 6am wake up because the sun came up! Sounds so easy–I sewed curtains with some blackout material, but these sound wonderful! Those look great! I feel like I have to send my kids to bed earlier than usual in the summer because they get so work=n out at camp during the day!! These would come in handy! In the summer it’s not completely dark until nearly 9pm around here. I love that I can still start our bedtime routine at 6:30pm without anyone saying, “but it’s still bright outside”! They sleep so much better now. My son can’t nap with any light coming in. I’ve been putting blankets up in the windows, I had no idea there was such a product. The review was helpful, thanks for sharing! Sara, i’m so glad that you found this review helpful! This product will definitely help. It blocks out ALL of the light. My hubby works shifts and often has to sleep during the day, so we installed one in our room as well. I suffer from insomnia and it was a bonus to find out that I sleep better at night with the window covers on because they blocked out the street light that was creeping in through our blinds! Hi, small question. I didn’t quite get it, say I have the blackout EZ on my window for the night, but I want to remove it during the day and restore it at night. Does it mean I have to remove and replace it every time? Is it complicated? Yes, you would need to remove it and replace it every time. But it is not at all complicated. The covered is secured by velcro, so you simply peel it off and store it away and then put it back on when you want to use it. You can see how easy it is to peel on and off in the video, I just don’t remove it the entire way in the video because I’m short and would need a stool to remove it completely. We have ours in the bedrooms, and we only use our bedrooms for sleeping, so we keep ours on all of the time. However, they are easy to remove if you need/want to. You can also try to find different ways of holding the window cover “up” during the day so that it doesn’t need to be completely removed. If you see in the video where I show the cover partially folded up to make room for the air conditioner, you could attempt to put the velcro higher on the window so that it will hold the cover up purposely exposing the light. But the purpose of the cover is to block out light, so obviously if you want the room well lit, your best bet is to remove the cover completely. This sounds like an amazing product. I need it for my son’s room, I am assuming if using during the day it helps keep some of the heat out as well. That’s an amazing bonus that I forget to mention in my review! I honestly never even thought about the amount of heat that it’s keeping out. The other day I was in my son’s room and for some reason I decided to reach under the blinds and touch the window cover…it was sooo hot! I was so glad that amount of sun and heat wasn’t beating down directly on my little guy while he took his nap! I might have to look into this idea. I have two of those odd shaped half moon windows in the front of the house. We bought the window shades made for those type of windows but they still let in way too much light/heat. 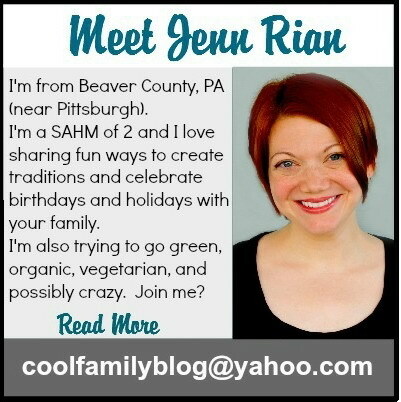 Found you via the BloggyMoms August Hop, and so glad I did! This is a great review of a product our family could use! 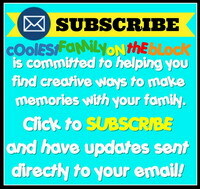 You can visit my blog at http://mooshkatoo.blogspot.com. Looking forward to your future posts! Those things have saved my life. That is a slight bit of an exaggeration, but if you’re a parent whose child’s room faces the sunny side, you get it. LOVE me some Black Out blinds! !